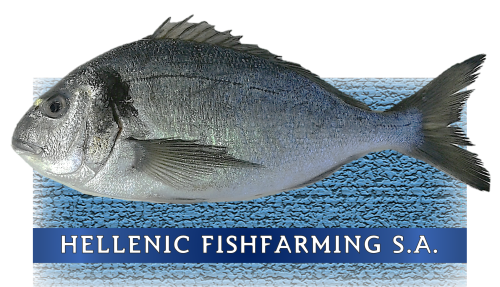 Sea Bream (S.Aurata) | Hellenic Fishfarming S.A. The gilt head sea bream (sparus aurata) is a fish with a distinctive silver- blue color. The body is oval and has a black spot on the gills. Also displays a golden yellow color between the eyes. In regards to the morphological characteristics of Sparus Aurata, we observe that its size is usually 30-40 cm in adults and the maximum stated in literature is 70cm. However it has been observed an atom with length of 76cm (France 2000, Florn Estuary, Brest). 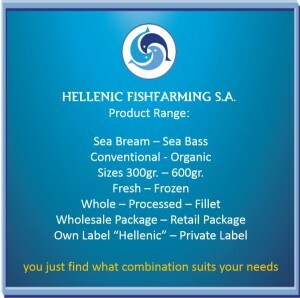 Although the maximum weight of fish that has been published reaches 17,2 kg, the weight usually ranges around 300 gr. to 600 gr. The body is oblong, thick and compressed laterally. The head is large with steep, short muzzle. 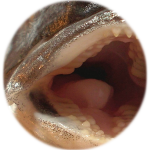 The mouth has six small canines and the lower jaw has many small rounded teeth in 5-6 rows which serve to smash food (shellfish). The Sparus Aurata lives in subtropical climates (60 ° N – 14 ° N, 26 ° W – 36 ° E). It is common in the Mediterranean, present along the eastern Atlantic coast from Great Britain to Senegal, and is rare in the Black Sea. Representatives of the species are found around the Canary Islands. The bream is usually found in rocky bottom with algae but can also be met in sandy parts. The young fish remain at low depth (up to 30 m), while adults can reach deep waters of maximum depth of 150 m.
The Sea bream lives either isolated or in small gatherings in the natural environment. It is mainly carnivorous fish, which migrates during spring to brackish coastal lagoons in search of ample food and milder temperatures (food passage). Very sensitive to low temperatures (lower lethal limit is 4 ° C), in late autumn return to the open sea, where adult fish breed. The average age at which fish are found in the wild is between 1.4 and 4.4 years. However in captivity can double this, with a maximum published age of 11 years.